9am - Little Honda has an appointment this morning at Trachsel Body. Honda's rear bumper is to be replaced. 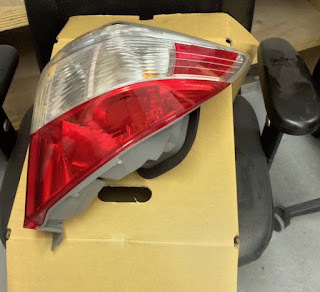 Also, right-rear tail light. 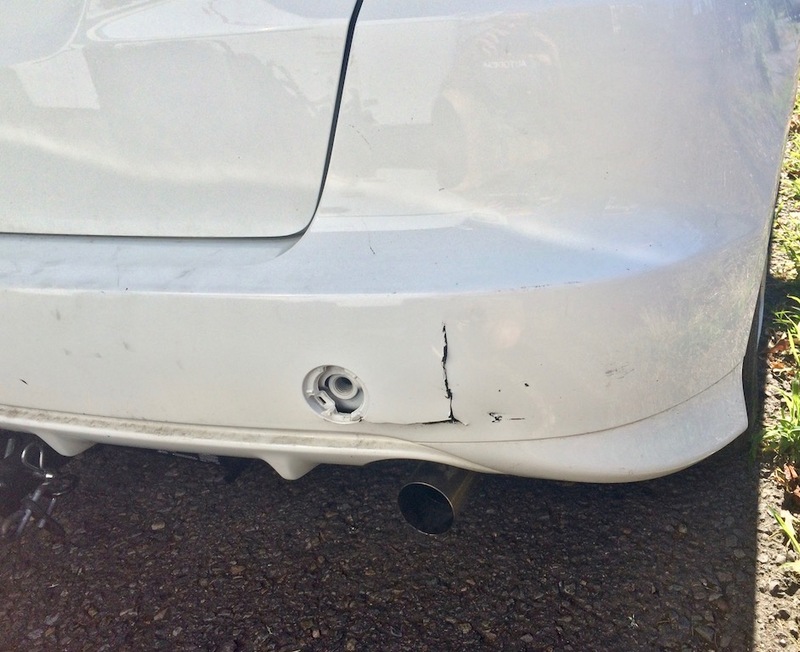 It seems that George bumped that bumper numerous times while hitching up to Scampy! Also, just recently, some guy was guiding while we were backing up. He guided us into a pole! 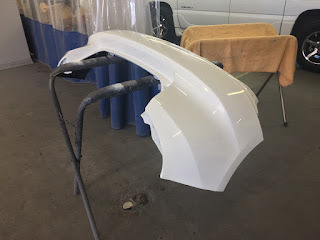 That was the coup de gras for the bumper. Would you care to see Little Honda's new parts? I've begun the learning experience of how to sell a car. Did you believe that we would race back to Tránsito to work on the cabinet installation? Ha! Nope! Plenty time for that! Every other day we go to 24 Hour Fitness, if there's one close by. PS: We like Salem, Oregon! We are now back with Tránsito, across the road from Mohr Motors. This afternoon, Scampy's battery was checked and although specific gravity is in the Good Range, it's not good enough. 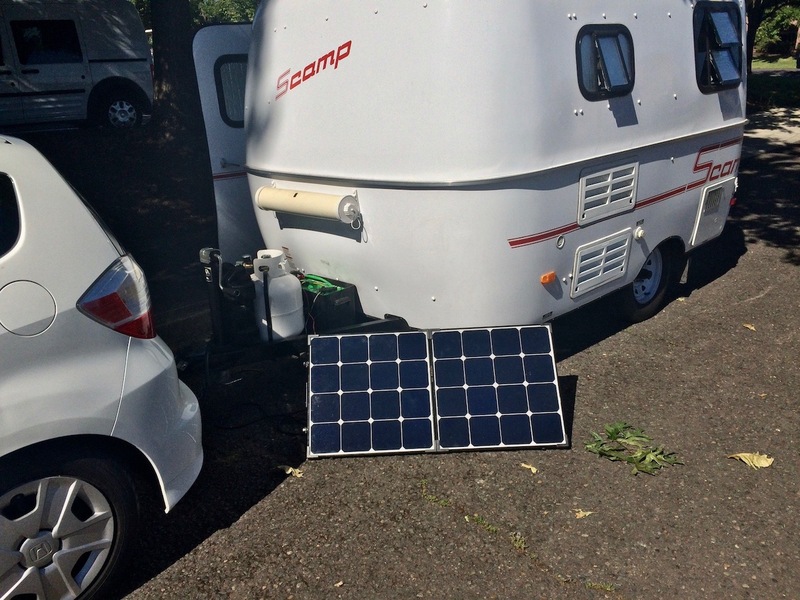 The battery is now being charged by our Renogy solar system. Getting auto insurance for a person who travels around is odd. ➜ Insurance company: What is your physical address? Me: In front of Scampy. ➜ Insurance company: Where is your vehicle garaged? Me: There is no garage address. ➜ Where is your vehicle located at this time? ➜ Insurance company: We need a street address. Me: I have no street address. ➜ Insurance company: Insurance regulations require a street address. Me: I guess that means no auto insurance for me! ......the tough go out to eat! Today is the shits! Everything was hard. 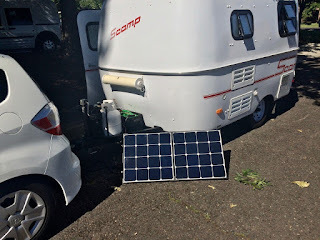 I checked into an RV park because Scampy's battery would not send power thru our inverter. First time that happened! I wanted to prepare a steak for supper. But! My grill is inside Tránsito. And Tránsito is back where we left him, across from Mohr Motors. So, I went out to eat. I chose Shari's Cafe. At Shari's, I wanted a milk shake. The price is $3.99 on the menu. Waitress: What kind of burger to you want? Me: I don't want a burger. Waitress: The shake is $5.99 if you don't get a burger. Me: I pay $2 more if the shake is not ordered with a burger? Wow! $2 more!? Can you imagine that? I asked to see the manager. Me: I would like to receive a $3.99 shake with something else on the menu. Manager: You will be charged $5.99 for a shake if you do not order a burger. 11pm - Guess what happened? The manager came back after I had finished my meal and asked, "How was the food?" I told her that the food was good. Service was good too. My only problem here was the $2 premium on my shake. She told me, that she comped my meal! Wow! So I gave my waitress a $5 tip. When I was younger I watched some guy guide my grandpas brand new 40ft class A RV into a giant oak tree. Some guys! After Little Honda smacked that pole, the guiding guy just disappeared! Hiding I suppose? Thank you sooooo much for telling me about that Transit conversion. Thank you for your heads-up advice! Do you have a suggestion about best way to advertise? Yes, and I may just go to a dealer. It would mean about $1,500+ less money for me. And make sure you go with the buyer to tranfer the title to make sure it really happens. I learned that the hard way when my brother never bothered. He drove it for over a year with my old license plates and titled in my name. (You think you could trust a relative.) I ended up being responsible for all his parking tickets! He also never paid me the last $400 on the car! I learn lessons the hard way, also. I guess that you did not read about me buying from Mohr Motors? I bought a hitch guide.
" I guess that means no auto insurance for me! " Does that also mean no vehicle registration? No tags? No, it does mean that. I have a kid in College in Oregon, how much do you want for the Honda? I need to buy her a car soon. The car is a 2013 Honda FIT. Close to excellent condition. 16,903 miles. Where do you get your mail? Can you use that address for insurance? Or Apple Valley? Or Rowena's address? The people at the insurance co don't care where you live. They just have to put something on the form, and know where to send you junk mail ;). You wil get a biiiiig ticket if a cop sees you do not have insurance. The problem with choosing an address [where I do NOT live] is that I must provide proof that I live there. W2, utility bill with that address, etc. Often the only proof needed is a piece of mail that was delivered to you at the address. You coukd send yourself a letter at Rowena's address (or the zddress of any nearby friend). She coukd put your name on her mailbox, along with hers, so the mailperson doesn't get confused. Sorry about the 'unknown' name. It is my first time commenting and I can't figure out how to change it. I have been following your blog for a while, tho! If you do sell on Craigslist, do the deal at the police station parking lot... Mention of that will keep the thieves from agreeing. No one with good intentions will meet you there... This has worked well for me in past.